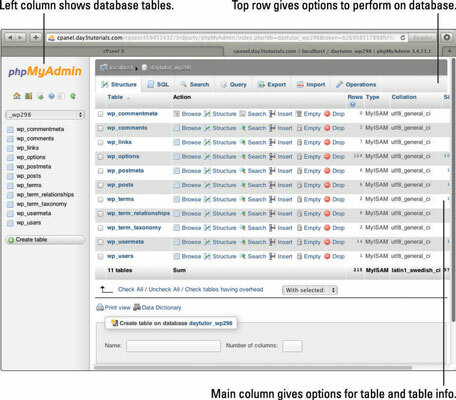 phpMyAdmin is the go-to tool for quick, easy web hosted MySQL administration. Installed automatically on most web servers, it offers an intuitive and easy way to manage your databases through your browser. Click on the phpMyAdmin icon, which may be in the databases section or may be somewhere else, depending on your control panel. If asked, enter the user details for your database. You set up the user details when you create the database. If the database was set up automatically by a script you are using, there is usually a configuration file that holds the username and password. For example, if you are using WordPress, the wp-config.php file in the root of your WordPress folder has the details you need. 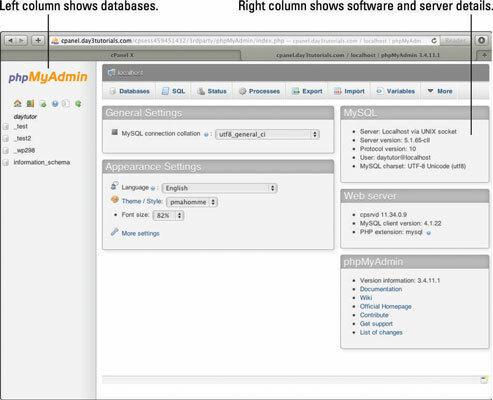 The phpMyAdmin front panel opens. A column on the left side lists your databases. Depending on your hosting plan limits, you could have a number of databases listed here, one for each web script you have installed. There may also be a database listed called information_schema. This is a kind of master database that holds information about the makeup of your other databases. It should be impossible to edit or delete it, but steer clear of it, just in case. The right-hand column displays information about the server and options for what you can do. 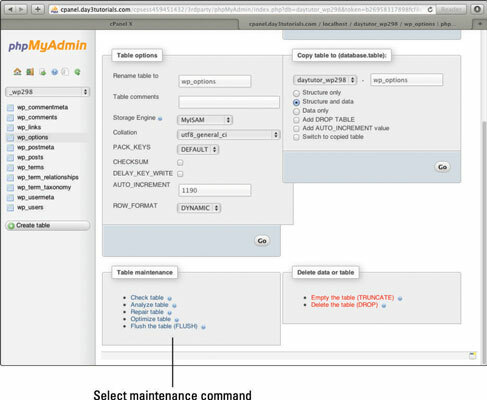 To start managing your database, in the left column click the name of the database you want to manage. Be sure to select the correct database. Over time, you may have created more than one database, and it’s important to select the right one. Check your web script’s configuration file for the name of your database if you are not certain. Select the Browse option next to any table to see and edit the data held in that table. Do not click Empty or Drop. These commands completely empty or delete the table. Unless you are sure you want to do this, you should avoid these options completely to minimize the risk of doing damage. The column labeled Rows shows the number of records in that table. This can be useful to help you find the table you’re looking for. For instance, if you have a blog, the table with the most rows is probably your blog posts. The Overhead column is important for maintenance. The Size column shows you how much space the table is taking up. The overhead is then calculated by taking the actual amount of data in the table from the table size. If there is a number in the Overhead column, it shows you that there is wasted space and the table needs to be optimized. Click on the name of the table. Click Operations on the menu along the top of the window and scroll to the bottom of the page until you see the Table Maintenance section. Click the command you want to run. A Flush option is also available. This command flushes the internal caches, which can sometimes help speed up the database. Select the table(s) you wish to work on. Scroll to the bottom of the table list and click the drop-down list. Select the command you want to run from the list.